Citation Information: J Clin Invest. 2019;129(2):546-555. https://doi.org/10.1172/JCI121842. Deficiency of STING attenuated MCD-induced hepatic steatosis and fibrosis in mice. WT or STING-deficient mice (Tmem173gt) were exposed to MCD for 8 weeks to induce NASH. Paraffin-embedded liver sections were stained with H&E (A) or Masson-trichrome (B), and hepatic histological scores and fibrosis area were calculated. Scale bars: 200 μm. Graphs showed levels of cholesterol (C), triglycerides (D), and hydroxyproline (E) in livers and levels of ALT (F) and AST (G) in serum. n = 9 in each group. Values are shown as mean ± SD. 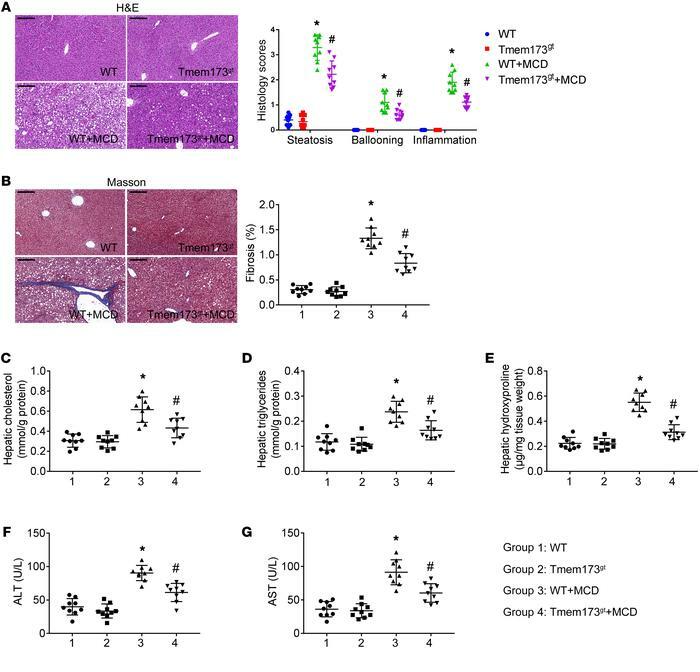 *P < 0.05 versus WT mice fed with control diet; #P < 0.05 versus WT mice fed with MCD. Statistical significance was determined using 1-way ANOVA followed by Tukey-Kramer multiple comparisons test.